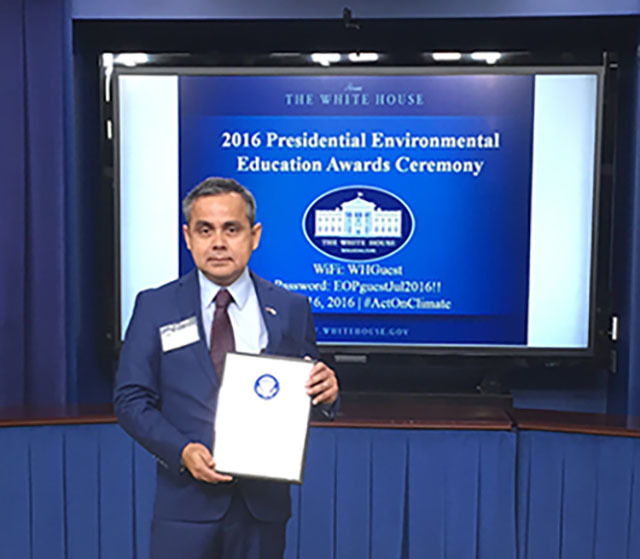 Brawley Union High School Teacher Jose Flores at the 2016 Presidential Environmental Education Awards Ceremony in Washington, D.C.
Jose Flores was in the movie theater when he received an email on his phone about earning the Presidential Innovation Award for Environmental Educators. In disbelief, he read the email several times. “I was surprised,” said Flores, a history teacher at Brawley Union High School. “At first I thought it was a prank email sent by a friend, but then I realized it wasn’t,” he said. The email was sent by a public affairs officer from the U.S. Environmental Protection Agency, which co-sponsors the award with the White House Council on Environmental Quality. Every year, this presidential award honors outstanding K-12 educators who incorporate innovative environmental lesson plans into their curriculum. Although many of Flores’ lessons have a health and science focus, his classes are centered on civics. For the past five years, with the support of his principal and superintendent, Flores has designed and fine-tuned his own program to educate and empower his students to become civically engaged in their community. This isn’t the first time that Flores has been acknowledged for his civic learning curriculum. In 2014, Flores and his school received the Civic Learning Award of Excellence. The awards program is co-sponsored by California Chief Justice Tani G. Cantil-Sakauye and is presented to distinguished educators who engage students in civic learning. One of the civic-based projects, for which Flores is being nationally recognized by is monitoring air quality in Brawley. Armed with handheld, Bluetooth-enabled air monitors, Flores’ students walk around Brawley and detect the amount of toxins in the air. The monitor then sends data electronically to a mobile app that uses a color-coded scheme to explain whether or not the air is safe. For example, a “red” code means the air is extremely hazardous and “green” signifies the air is clean. Through the civics program, Flores and his students have raised awareness about Brawley’s air pollution and educated parents, many of whom are migrant agricultural workers, on how to lessen their exposure to pesticides. While Flores is proud of the program he has developed, he also realizes that it isn’t perfect, he said. He plans to collaborate with his colleagues to design an inter-disciplinary curriculum for all Brawley Union High School students. “I’m not just teaching government, social studies or environmental science. I teach all of these subjects through civics. It’s a fusion,” he said. 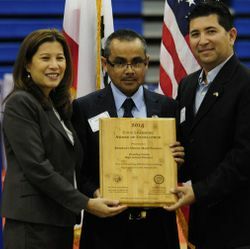 Flores received the Presidential Innovation Award for Environmental Educators on August 16 in Washington, D.C. Teacher Jose Flores presents to the Judicial Council in April 2016. View on YouTube.